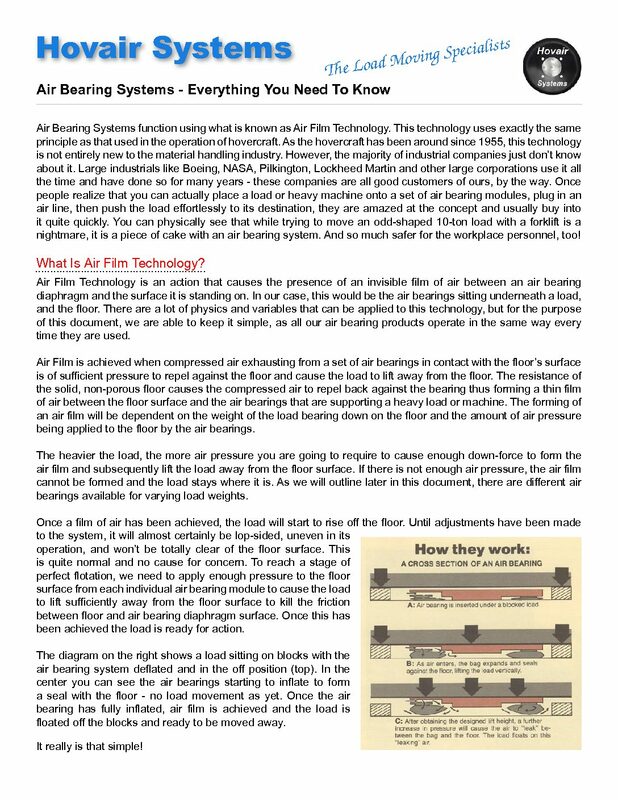 Air Bearing Caster Information - What Sort of Floor Surface Is Required? CLICK HERE TO CONTACT US For a smooth, trouble-free operation of your air bearing kit, or system, the floor surface should be level, smooth and non-porous - preferably concrete. The best floor surface will have no cracks, holes or indentations. Minor cracks and small holes can be easily filled with an epoxy resin type material. See floor surface specifications. In some cases it is permissible to lay sheets of aluminum-type sheeting to act as a pathway for the load moving exercise. As long as the base surface is reasonable flat and level this can work fine. Talk to one of our support staff for more info on this method.